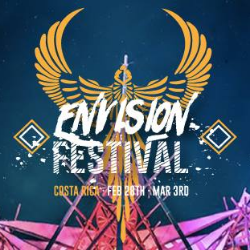 Returning to the paradisal Pacific Coast of Uvita, Costa Rica from February 28th through March 3rd, 2019 and showing the wildest lineup to ever step foot in the jungle for the ninth edition of Envision Festival. Masterfully crafted for a jungle celebration that you’ll never forget, this Phase 1 lineup continues tradition of serving up heavyweight performers alongside stylish, avante garde talent from the most culturally rich underground communities in Europe and the Americas. Peer even further into the future with artists intentionally selected to awaken the self to a higher consciousness in alignment with the natural harmony. Every year a strive to deliver an intentionally crafted, all-encompassing musical experience and this year challenged the status quo by proving that lineups can be culturally diverse and still arrive stacked with a bevy of talent with an unmistakable must-not-miss allure. Delivering a new, holistic spin on the conventional music listening experience. Featured headliners like the Hawaiian hybrid, Trevor Hall, continue a tradition of flavorful folk, reggae and roots, while elektro funk pioneers, The Floozies, will serve up jams from the jazz capital in the heart of Kansas. San Francisco’s Tycho, presents smooth psychedelic ambiance alongside the dark house beats from Bedouin, for a combination of sweet and savory that is seldom experienced in the jungle. Soon it’ll be time for the taste of the blissful sounds of Burning Man, with timeless ‘Legend of Robot Heart’ and ‘All Day I Dream’, Lee Burridge alongside the recent salsa house fusion aficionado fresh off the Mayan Warrior, Nicola Cruz. Then Sabo, the globally recognized dance music legend, stops by with a tropical flair we’ve all come to love about the Envision experience. CloZee makes her 4th appearance at the festival, both as a fan favorite and as France’s most valued export in kundalini-blasting bass music. Rounding out the last of the top slots in the first lineup release, we look forward to introducing Detroit original and soul funk marvel Grant Kwiecinski for a must-not-miss debut performance of GRiZ on the Luna Stage. 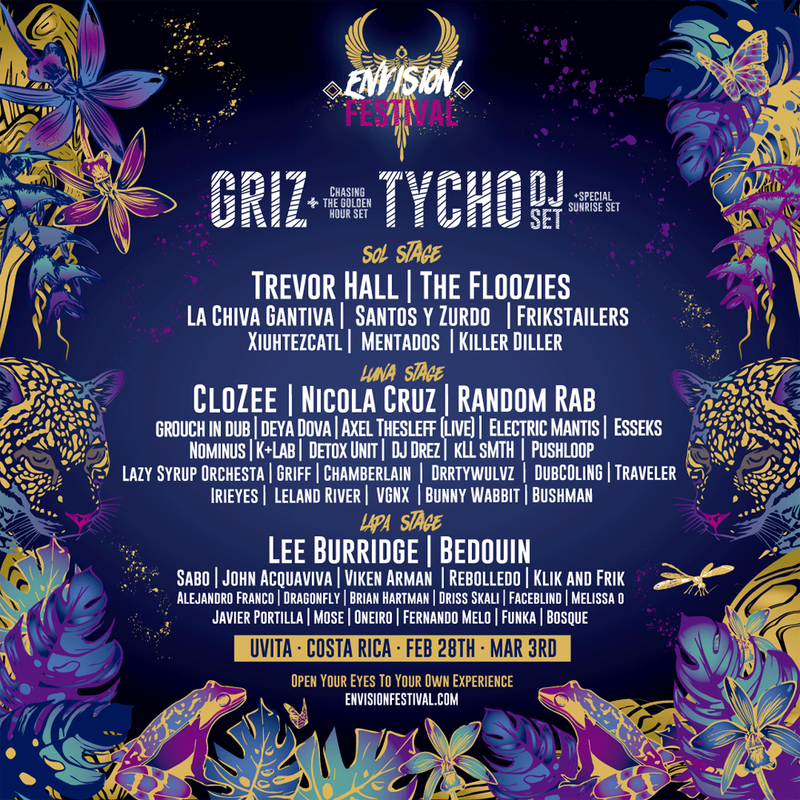 In addition to being a banner year for international music at Envision Festival, 2019 will be a celebration of Latin America’s most vibrant and colorful luminaries in dance music. With strong representation from world famous Costa Rican artists like Santos y Zurdo, Faceblind, Bunny Wabbit, Javier Portilla, Melissa O, and Mentados, Latin culture lovers can look forward to ska reggae fusions and the sound of future nostalgia.